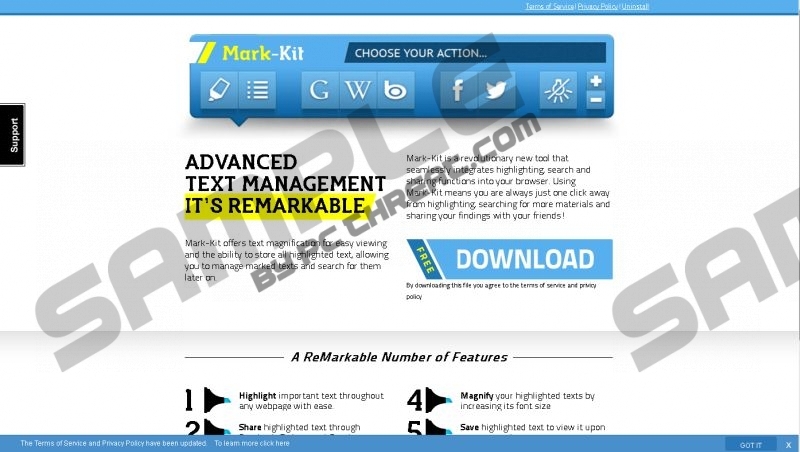 Ads by MarkKit might start appearing on your screen if you install MarkKit application on your system. Even though this program usually travels bundled with freeware, it is very likely that computer users might download and install it themselves because this application seems as a very useful piece of software. Unfortunately, we do not recommend keeping MarkKit on the system because it is nothing more than just a typical advertising-supported application. It means that you will suffer from the presence of MarkKit ads and might even infect the system with malicious software. In order to get rid of those Ads by MarkKit, you should erase MarkKit as soon as possible. Continue reading the article and find out how to remove the program responsible for Ads by MarkKit easily and quickly. Even though the publisher claims that MarkKit is a revolutionary tool that allows you to highlight, search, and share the information, it is still not advisable to trust it because this piece of software might take you to corrupted websites after clicking on any of those ads that it is going to display. On top of that, your activities on the web might be ruined as well. If you ever encounter Remarkit and Bestmarkit, which are based on the same template as MarkKit, you should know that they are going to act in the same manner and it is necessary to erase them from the system as well. If we have not convinced you to delete MarkKit yet, you should know that this piece of software is going to record data associated with your activities on the web. Thus, if you keep this software on the system, the websites that you visit, the search queries that you enter, IP address, the version of the OS, and other similar data will be recorded. According to the publishers, this data will be used in order to show you Ads by MarkKit. Furthermore, the specialists of pcthreat.com have also found out that this undesirable software is going to transfer this data to third party advertisers. Unfortunately, it is not clearly known whether this data will not be used for unfair purposes. Luckily, you can delete this advertising-supported application entirely from the system and thus stop of all of its suspicious activities. You will be able to do that using the instructions provided below the article. Of course, you can also get rid of it automatically. Just scan your system with a reliable security tool, for instance, SpyHunter and you will not see Ads by MarkKit anymore. Select the undesirable software and then click the Remove button. Right-click on MarkKit and then select Uninstall. Find the program that needs to be erased. Select it. Click the Uninstall button to confirm the removal. Quick & tested solution for Ads by MarkKit removal.